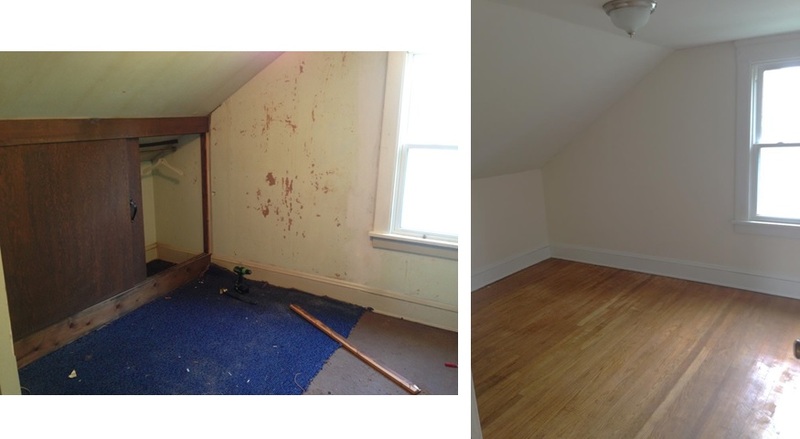 I promised before & after pictures of our latest rehab property and here they (finally) are. The rehab was completed a few weeks ago and our new tenants, three college students from my Alma Mater, moved in just a few days ago. The house was purchased from an estate, with the previous owner occupying the property since 1973. Challenges includes a structurally deficient garage, water intrusion in the basement, as well as carpet and wallpaper throughout that were stained by years of cigarette smoking. In addition, kitchen and bathroom were in need of updating. The most time consuming aspect of the renovation was the removal of the yellow-tinted wallpaper in every room in the house. Even on the ceilings! After the wallpaper was removed, the drywall was full of gashes and pot-marks that needed to be filled and sanded. This alone took more than a week to do. What’s more, all of the beautiful trim in the house was stained yellow from 30+ years of cigarette smoking. Nothing an industrial paint sprayer can’t handle, though! Dining Room & Living Room: After the wallpaper was removed, the walls were coated in Kilz Primer (to seal the smell of smoke) and then painted using “Pip” by Martha Stewart. Trim was painted, chandelier replaced and hardwood refinished. We also updated the hardware on the beautiful built-in cabinets. 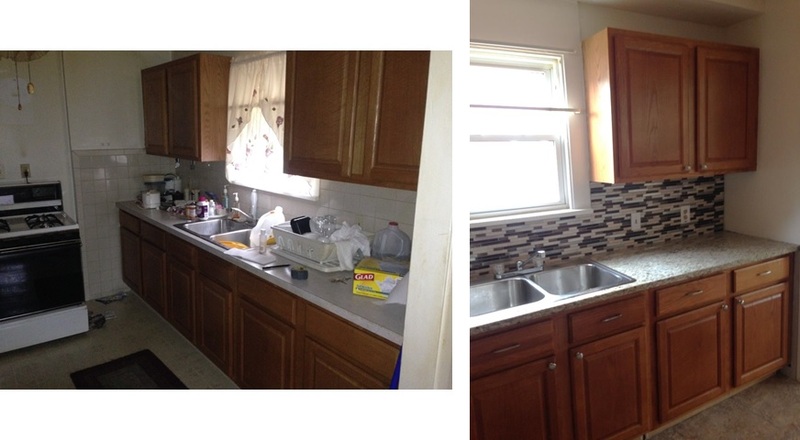 Kitchen: The cabinets were recently updated and in fantastic shape, so we decided to keep them. 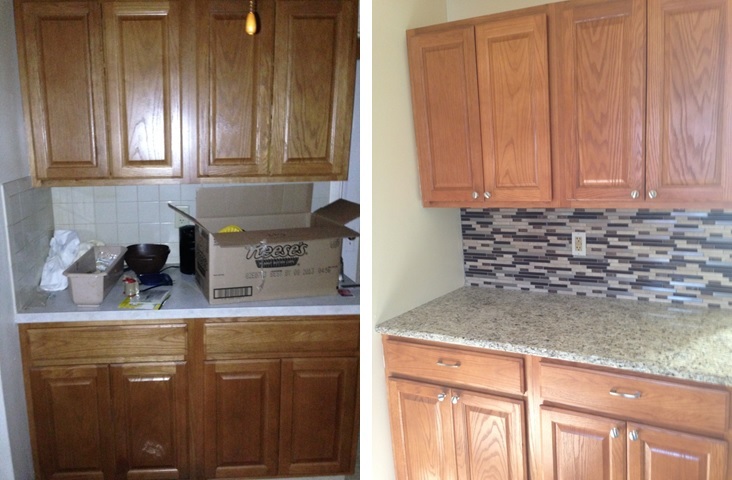 I’m not thrilled with the finish, but the new granite, backsplash and hardware does certainly ease the pain. We also installed luxury vinyl tile throughout the kitchen, which is a breeze to install (peel & stick!) and can truly pass off as more expensive tile as the seams are grouted. 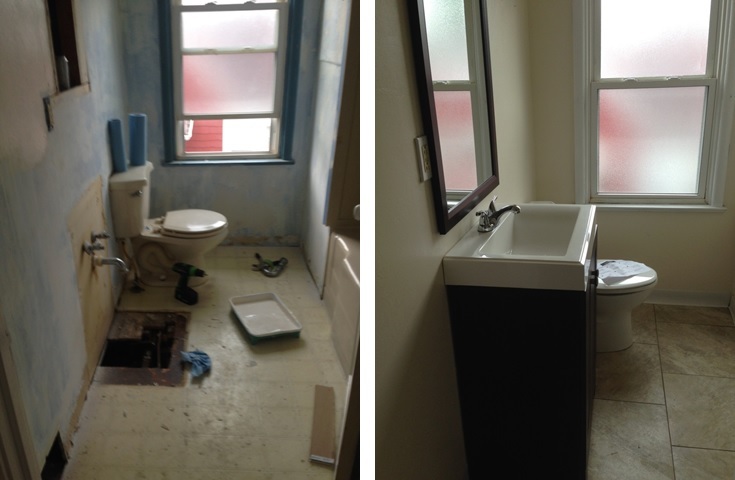 Bathroom: We replaced the vanity and toilet, painted the walls after removing the wallpaper and installed the same LVT as we had in the kitchen. Basement: This was quite the headache. There was a tremendous amount of water intrusion in the basement, so we opted for an interior waterproofing system (B-Dry). Once that was completed, we framed out half of the basement to create a finished play area. Bedrooms: Most of the bedrooms were straight forward; remove wallpaper and paint. One of the smaller bedrooms has an unsightly closet that made the room feel even more cramped than it already was. Looks much better without it! So, with that, on to the next one! We have a few in the works right now, including a 3,300 sq. ft. home built in 1914 (!!!) and a gorgeous duplex in a historic part of town.